Very impressed. She was very professional, pleasant, clean, and knowledgeable. The overall service was 5 star. I highlyrecommend her. Very courteous and professional staff. At first, I was a little annoyed they asked that I go back after receiving newcontacts to test that they worked, but it turned out the prescription actually was a little off, so it made complete sense after all. I was in and out of there super quick on the second visit too. I also got an optional glaucoma test too. Would highly recommend. Very courteous and professional staff. At first, I was a little annoyed they asked that I go back after receiving new contacts to test that they worked, but it turned outthe prescription actually was a little off, so it made complete sense after all. I was in and out of there super quick on the second visit too. I also got an optional glaucoma test too. Would highly recommend. A qualified optometrist, Dr. Jacqueline Williams completed her medical training at the Illinois College of Optometry for doctorate and Illinois State University for undergraduate degree in biological sciences. 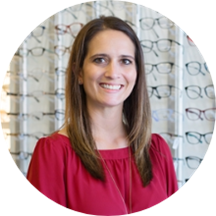 Dr. Williams is an attending physician at Rosin Eyecare and is skilled in her medical domain and welcomes patients for the treatment of a range of common and specialized conditions. She enjoys giving back to her community and has participated in many volunteering activities like providing free eye care to underprivileged communities in Guatemala for a week and provided eyeglasses, sunglasses, readers, and medications to hundreds of patients. Dr. Williams communicates with her patients with clarity and ensures they have all the information they need to make the right treatment choices. She is flexible in working with the changing trends in medicine and in the healthcare market. It was great. She made me feel comfortable and got the root of the problem. Everyone there is so nice and understanding! Highly recommend.